A horse, and several passengers, were hurt today when a carriage crashed in downtown Savannah. According to multiple sources, the horse was spooked before taking off and hitting a curb, which overturned the carriage, injuring seven people inside. The accident happened late Friday morning near Warren Square – five of the injured passengers were transported to a nearby hospital with non-life-threatening injuries. As reported by Live 5 News, the horse is expected to be okay. Witnesses to the incident report seeing the horse “out of control” moments before the crash – one witness stated that the passengers were all “pinned” beneath the carriage after the accident. Horses are high-strung and so don’t belong on busy streets, where construction noise and sirens can easily panic them. This wasn’t the first time that a horse-drawn carriage accident in Savannah has sent people to the hospital, and it won’t be the last unless the city joins others that have ended the practice of forcing horses to toil for tourism. 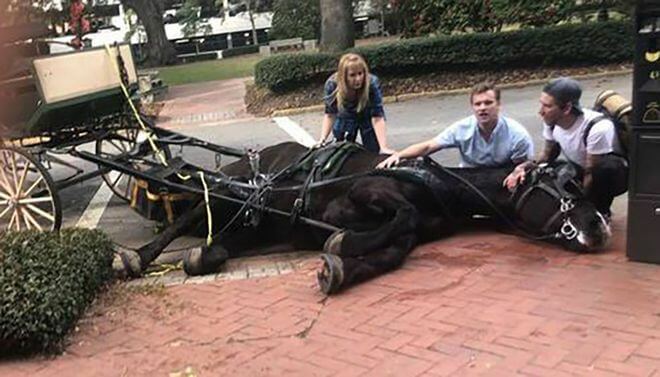 THIS IS EXACTLY WHY THESE CRUEL HORSE CARRIAGE RIDES SHOULD PERMANENTLY END! HORSES ARE NOT MACHINES! I had a horse for 17 years, they are sensitive animals. they don’t belong on the street with cars. there are horse trails where I live next to the streets but the horses are used to them. they are Not in the streets with the cars. I really wish they would make horse drawn carriages a thing of the past! Horses don’t belong on city roads! Thank goodness the horse was ok! Seven people bring drawn in a carriage??? Makes me see red! I feel bad for the passengers that got hurt but I feel more for the horse! The owner should pay a fine for overloading carriage!